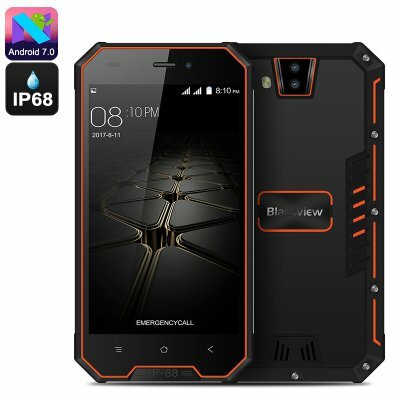 Successfully Added HK Warehouse Blackview BV4000 Rugged Phone - Android 7.0, Dual-IMEI, 3G, Quad-Core CPU, HD Display, IP68 (Orange) to your Shopping Cart. If you’re looking for a tough Android phone that keeps you connected through days’ worth of usage time, the Blackview BV4000 is perfect for you. With its whopping 3680mAh battery, it treats you to 18 hours of continuous usage time. Additionally, it supports an unbelievable 25 days of standby time. This allows you to use your phone through numerous days of regular smartphone usage without needing to worry about running out of juice. The next time you head out into the wild, you no longer have to worry about bringing along your charging kit. The Blackview BV4000 packs enough juice to keep you connected for days to come. Within its IP68 waterproof body, this rugged smartphone packs a Quad-Core processor. Additionally, it comes with 1GB RAM and 8GB internal storage. The latter of which can be increased thanks to the phone’s 32GB SD card slot. If you wish to enjoy basic media such as movies, Apps, and games on the go, this Android phone is sure to meet your demands. All your favorite media can be enjoyed on the phone’s 4.7-Inch display in HD resolutions. The display itself features Corning Gorilla Glass 3, making it extremely tough and resistant to drops and scratches. To make sure you’ll be treated to great connectivity, this rugged smartphone supports Dual-IMEI numbers. This means that you can insert two SIM cards and stay connected to both of them at the same time. Your Android phone furthermore supports 3G thanks to which you’ll be able to browse the web at any moment. Along with its Android OS, this rugged phone is guaranteed to deliver a smooth and pleasing smartphone experience. The Blackview BV4000 smartphone comes with a 12 months warranty, brought to you by the leader in electronic devices as well as wholesale rugged phones..